Adam and Eve were the first man and woman created by God, according to the Bible and the Qur'an. The story of Adam and Eve is central to the widely held belief that God created human beings to live in a Paradise on earth, although they fell away from that state and formed the present world full of suffering and injustice. It provides the basis for the belief that humanity is in essence a single family, with everyone descended from a single pair of original ancestors. It also provides much of the scriptural basis for the doctrine of Original Sin, an important belief in Christianity, although not shared by Judaism or Islam. 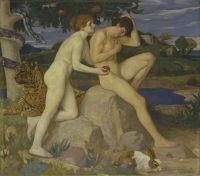 The story of Adam and Eve is the source of many of the most important symbols in Western culture, including the Garden of Eden, the Tree of Life and the Tree of the Knowledge of Good and Evil, the forbidden fruit, and the serpent as Satan. This page was last modified on 22 March 2019, at 19:14.